Note to self: Juan Mata apparently does not mind being interviewed at home. 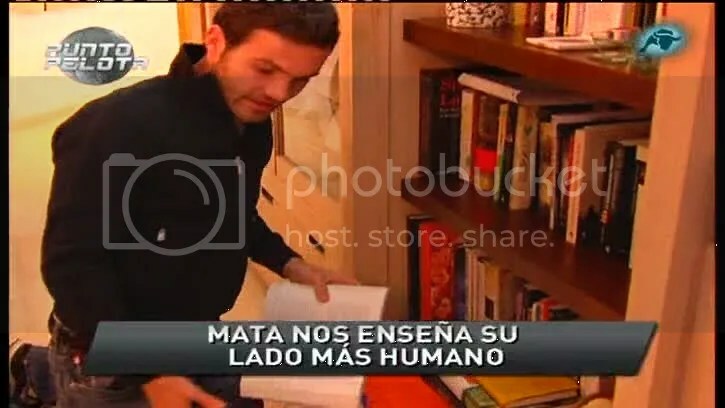 Irene Junquera from “Punto Pelota” followed in the footsteps of Samanta Villar, in this almost identical interview: they go to Mata’s house, look through his fan art, hang out in his kitchen and talk about his hobbies. The only difference is that Irene goes “oooooh” while Samanta had the unforgettable, “porrrr fa-vorrr, Juan Ma-ta!” But Juanín is adorable. Watch the video here. They start off in Paterna, the ciudad deportiva of Valencia. Juanín has to go to a team lunch (in the car, he says he doesn’t know where, but that he was just going to follow the others). The more interesting parts start when Irene arrives at his apartment. IJ: And now that Mata has finished with his lunch, we’re going to his house. We’re here! Is he going to answer the intercom? We’re here! Here we are in the elevator. We’re going to follow the light. Oooooh. How was the lunch? What did you eat? IJ: So are we going to go into your house? JM: Yes, if you want. First of all, thank you for letting us visit your house. It’s beautiful. Did you do all this yourself? JM: My mother did this, because she likes to decorate houses. She did well. IJ: How are you feeling after the thumping from Schalke? JM: It was a hard blow, because being one of the best eight teams in Europe is not easy. IJ: So who are you rooting for in the Champions now, Madrid or Barça? IJ: You were a canterano with Madrid, would you have liked to continue there? JM: That’s the past, everything that’s happened to me since I left the cantera of Madrid for Valencia has been great. IJ: During the World Cup, it was said that you wanted to go to Barça. JM: They were all rumors, rumors. I live in the present. IJ: Juan, you have a lot of things, but when you’re here, your eyes go directly to this. JM: It’s something that no one else has. It’s the real one, the one that Blatter gave us. It was made here in Valencia, a replica. Look how much it weighs. Take it. The players all got a small replica. IJ: I know that you receive a lot of female fan mail, that you’re very popular with the chicas. Can you show us some? JM: I have some in the other room. Let’s go. IJ: You sleep with this, don’t you? JM: No, I don’t sleep with that. Do you have any photos of you from when you were small? JM: Does it look like me? IJ: Your kitchen is beautiful and quite clean. JM: Yes, I don’t cook much. IJ: So what do you do normally, how do you eat? JM: When my mother comes… she makes a lot of food and leaves me a lot of things so I’m good for a few days. JM: She leaves me several. I make incredible salads… with lettuce, cherry tomatoes, goat’s cheese, everything. JM: Well since you placed this book strategically over here… I like to read. IJ: What are you reading? JM: I like this author, Murakami. Haruki Murakami. I’ve read of lot of his books. We have a lot of free time during the concentraciones and we watch movies, TV shows, and read. 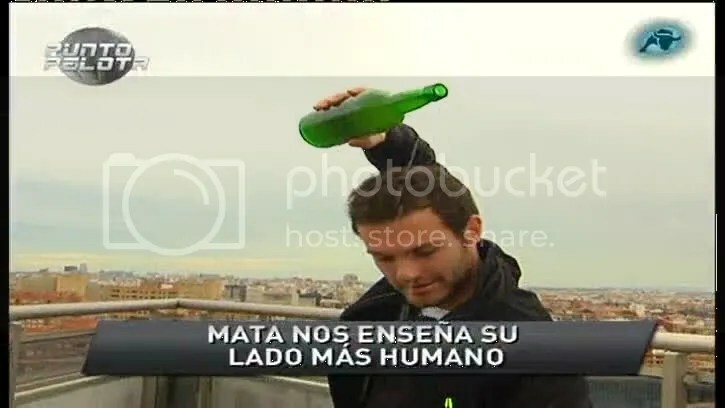 IJ: We’re going to test you to see if you’re a real Asturian. JM: We’re going to eat fabada? JM: Well we can’t do it in the house. When I bought this apartment, they told me, oh, you’ll be playing here shortly! I don’t know about that. JM: There’s a lot of wind! There’s a lot of wind! Posted on March 22, 2011, in interviews, players, videos and tagged mata. Bookmark the permalink. 6 Comments. 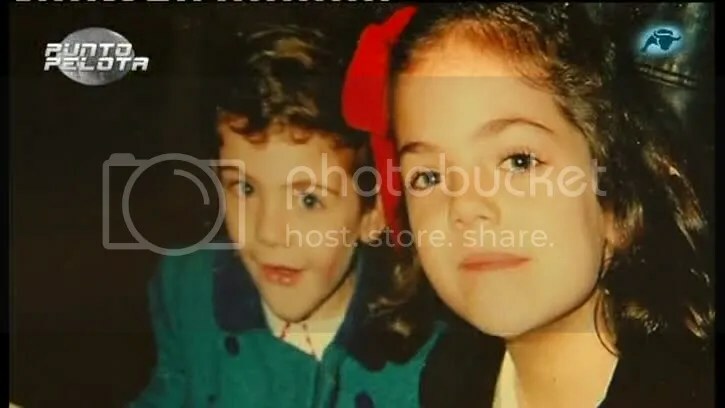 Those baby pics about killed me how cute is he, i love Juanin Mata! awww he looks sooo adorable…. when he was younger … so what hapen to him *lol* j/k … he still looks adorable…. He was such a sweet kiddy! Well, he still is (ignoring the beard). But I guess he’ll have to make some more space for fan-stuff in the future! 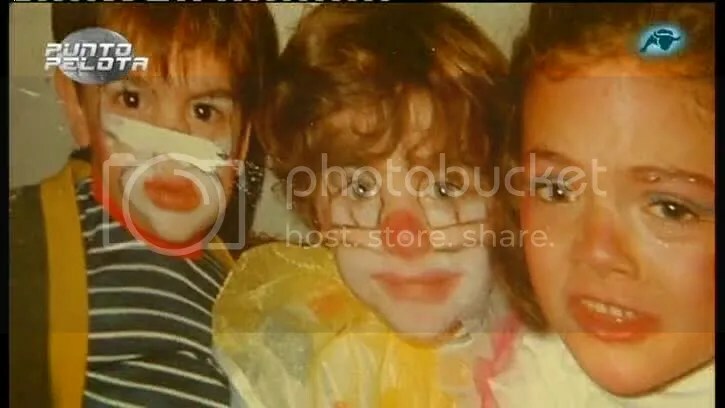 The pictures of Juanin as a child are so adorable.